A Pennsylvania pumpkin thief had a change of heart and returned a giant gourd to its owner — with a note saying sorry attached. Jaiden Newcomer, 9, was heartbroken when the 255-pound vegetable he’d won by guessing its weight at a York City Oktoberfest party was pinched from outside his front porch. His mom, Amy, thought it was the last they would ever see of the enormous squash. But on Sunday evening, the family returned home to find it had been mysteriously returned — and the anonymous thief had left a message apologizing for his actions. “I’m really sorry about taking your pumpkin,” it read. Jaiden won the 255-pound vegetable by guessing its weight at a York City Oktoberfest party. 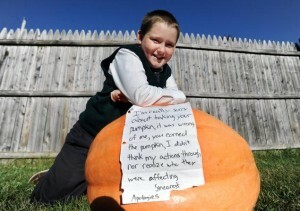 “It was wrong of me, you earned the pumpkin, I didn’t think my actions through nor realize who they were affecting. Sincerest apologies,” it added. At first, Jaiden wasn’t sure whether it was the same vegetable — but soon realized it bore exactly the same crescent moon shape on the side. But, as the pumpkin can’t be cooked, the family is now looking to buy ready-made pies and donate them to charity. For the second time in less than a week, a “sea serpent” has attracted gawkers on a Southern California beach. 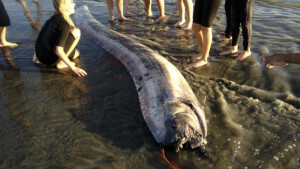 This time the rare, snakelike oarfish washed up Friday afternoon (October 18th) in Oceanside. The newspaper U-T San Diego reported that it measured nearly 14 feet long and attracted a crowd of up to 75 people. Oceanside police contacted SeaWorld San Diego, The Scripps Research Institute and the National Oceanic and Atmospheric Administration. Someone from NOAA retrieved the carcass, which was cut into sections for later study. While it’s unusual to find the deep-water fish near shore, on Sunday, Oct. 13, a snorkeler off Catalina Island found an 18-foot long oarfish and dragged it onto the beach with the help of a dozen other people. That specimen was spotted in water about 30 feet deep, and apparently died of natural causes. Tissue samples and video footage were sent to be studied by biologists at the University of California, Santa Barbara. According to the institute, oarfish can grow to more than 50 feet, making them the longest bony fish in the world. Because oarfish dive more than 3,000 feet deep, sightings of the creatures are rare and they are largely unstudied. 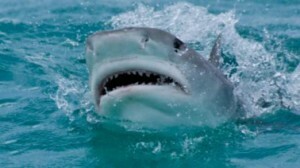 Former boxer Jeff Horton uses some of his ringside skills to survive a tiger shark attack while surfing in Hawaii. A surfer in Hawaii has survived being attacked by a shark after grabbing its fin and repeatedly punching the fish in the head. Jeff Horton, 25, was surfing near Kilauea when a fin was spotted in the water. Twenty minutes later, he was sitting on his surfboard with his legs dangling in the water when he spotted a dark shape approaching. Initially he thought it was a stingray, but was forced to quickly pull his legs out of the water as the tiger shark bit into his surfboard. The impact knocked Mr Horton off his board and on top of the shark. Holding on to the shark with one hand, he repeatedly punched it as hard as he could. It was only after his knuckle jammed into the shark’s eye that it spat out his surfboard and swam away. Mr Horton was able to scramble back on to his board and, along with another surfer, paddled to the shore as the shark briefly followed behind them. His 7ft board, which has a teeth imprint, will now be put up on his wall. New York City MTA train operator Danny Hay rescued a man who fell on the tracks and men who had come to his aid. A young man who was having a seizure fell off the platform at Manhattan’s Delancey St. station. Two riders jumped down to rescue him. Just around the corner an F train was barreling in their direction. Hay sprinted about 300 feet to the end of the platform. Using his flashlight, he signaled the operator of the approaching train to hit the brakes. “She saw the light and was able to stop the train at the mouth of the tunnel, just before it entered the station,” Hay said — preventing the three from being hit. 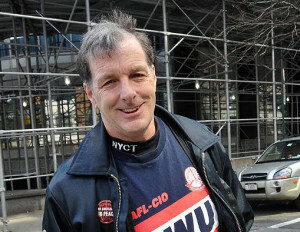 Hay, 56, is a train operator and an elected Local 100 vice chairman. On his way to work in downtown Brooklyn, Hay arrived at Delancey St. at 8:30 a.m. April 7, just after the young man fell. Hay tried to notify the Rail Control Center by radio but couldn’t get through, he said. So he raced to the token booth and instructed the agent to alert officials to shut off electricity to the third rail. When Hay returned to the platform, however, he quickly saw the situation had worsened. Now, there were three people on the tracks — and he could hear an F train in the tunnel. “The good Samaritans, God bless them, were trying to help the guy,” Hay said. They were still trying when Hay managed to bring the train to a halt.